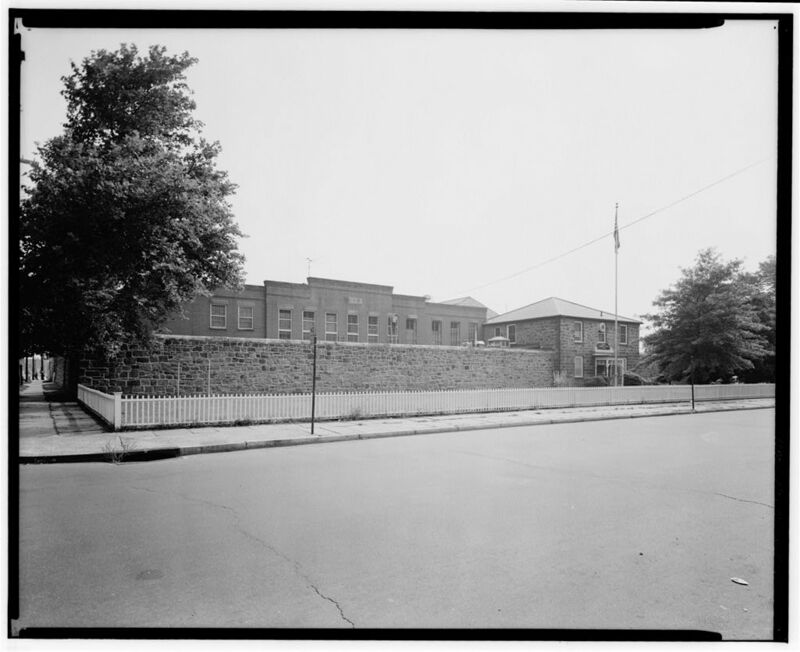 The Essex County Jail, in Newark, New Jersey, was constructed in 1837 and closed in 1971 when a new facility was completed. The jail was added to the National Register of Historic Places in 1991. In the summer of 1836, the city of Newark formally incorporated, and in a joint venture with Essex County, agreed to erect a government centre to serve both as a county courthouse and city hall. 1 The location was also to serve as a location for the county jail and poor house. The project was estimated to cost $71,000, of which $27,000 would come from the city. Famed architect John Haviland was hired for $30,000 to design the courthouse and jail. The jail, located away from the courthouse and at the weigh-lock of the newly opened Morris Canal, was completed in 1837. 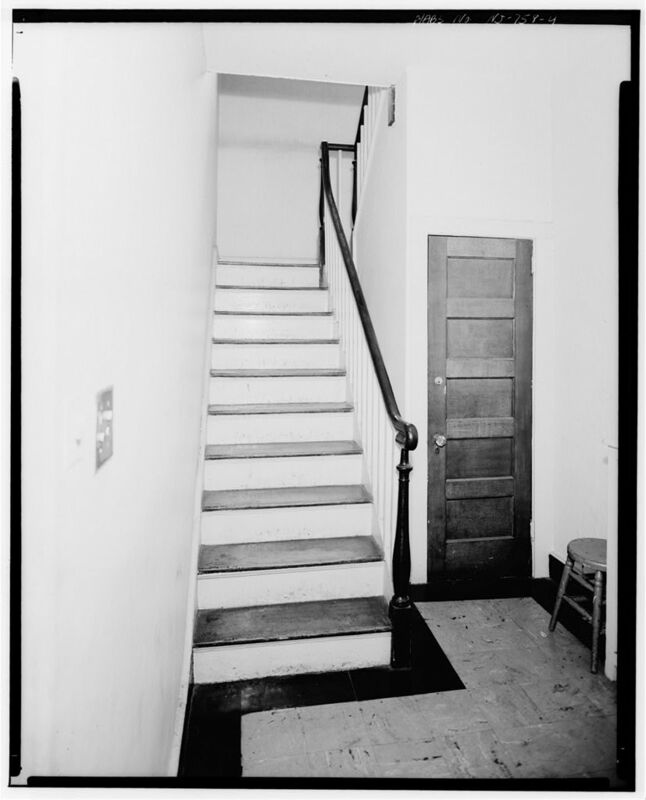 1 It included a narrow two-story brownstone building, which later became the east wing, and the warden’s house. The plan of the jail was a large square with interior courtyards partly surrounded by a 12-foot-high brownstone wall. 1 Initially, the wall only enclosed the southern half of the block. When prisoners were admitted to the jail, they were brought into the warden’s office where they were questioned and registered. 1 The officers sat behind a long desk on a raised platform and the prisoners had to stand behind a painted yellow line on the floor. The prisoner would then proceed to the centre of the room to be assigned a cell. Most of the offenders were sent to the jail for terms not more than nine months. In 1890, the Newark firm of Messrs. Staehlin & Steiger were hired to construct a west wing for the jail. 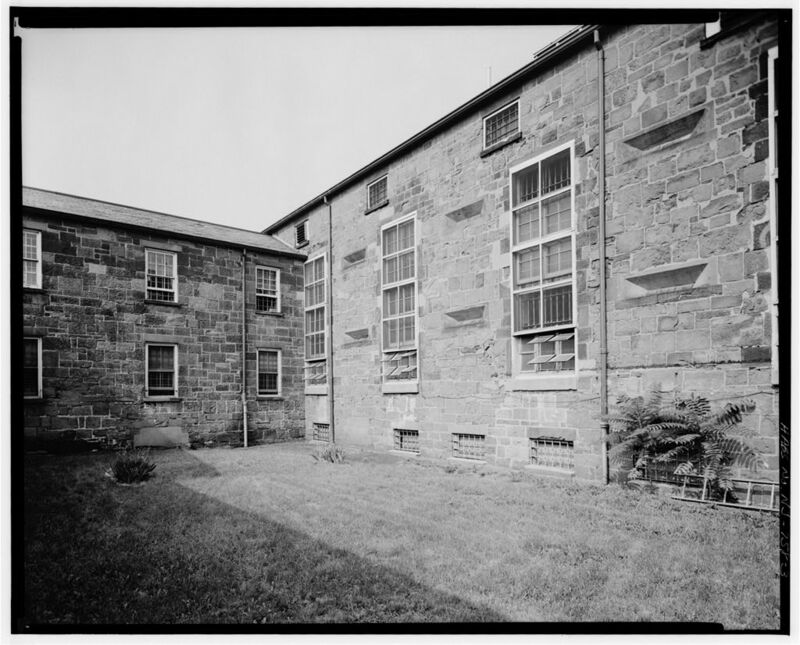 1 The two-story building they designed necessitated the removal of the west and north walls of the original prison, which were replaced by cast iron columns. Work on the new addition was finished in 1891. Gustavus Staehlin designed a new two-story wing for women and children in 1895. 1 The addition consisted of 82 cells constructed of sheet metal and included baths, a small hospital for women, a juvenile ward with a hospital ward, and a laundry. Before the construction of the wing, children were confined together with adult inmates, as were witnesses. The vacant northern half of the block, adjacent to the Morris Canal, was acquired and the 12-foot-high brownstone wall extended to enclose the entire block. 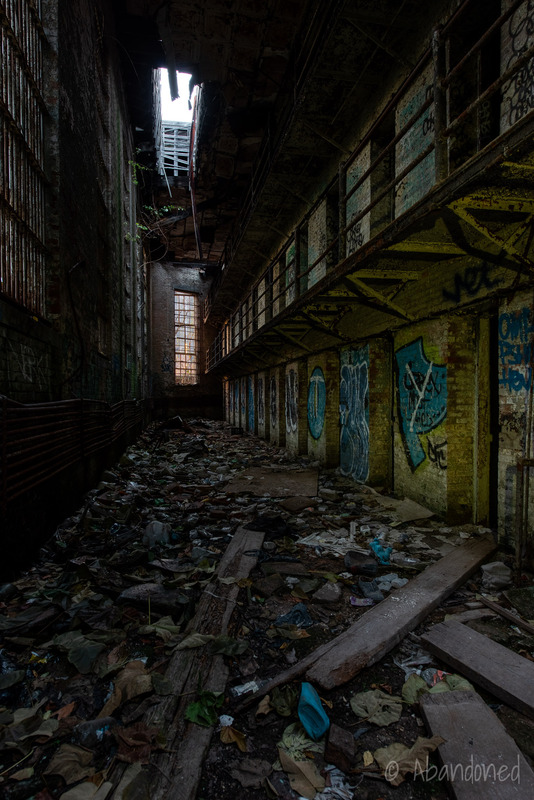 1 Two openings were provided, at Wilsey Street where prisoners were removed from the paddy wagons, and at Newark Street, where coal deliveries were made for the power plant. The openings were secured by heavy sliding steel doors. 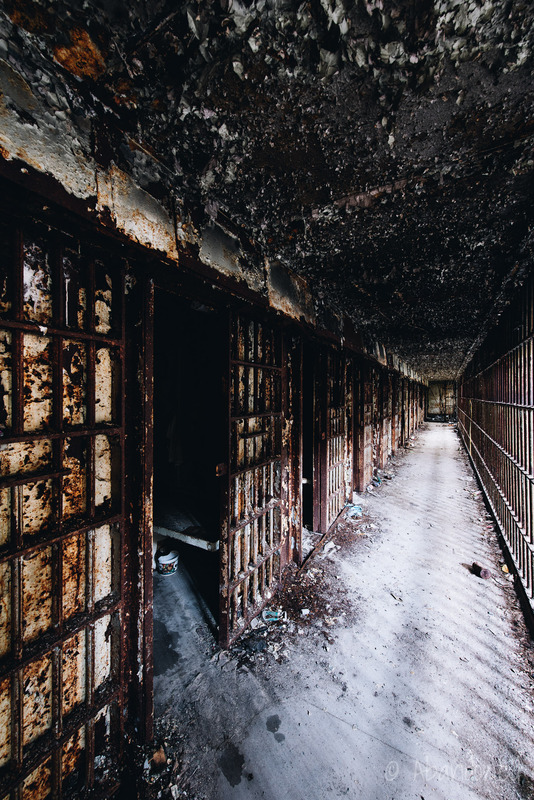 In 1907, the cell structure of the jail was replaced by new cell equipment constructed entirely of tool-proof steel furnished by the Pauli Steel Cell Construction of St. Louis, Missouri. 1 The tool proof locks were operated by a system of levers which could open the cells singly, in pairs, in groups of four, eight or twelve, or a whole tier at once. Each cell was given a hopper and running water. The catwalk flooring was replaced with heavy bullet-proof glass to allow the guards to see shadows below and above. Additionally, shower baths and a locker room were added on the first floor. 1 The shower baths were installed where the execution chamber once stood. A north wing and a power plant, both designed by Newark architect Thomas Cressey, were constructed in 1904. 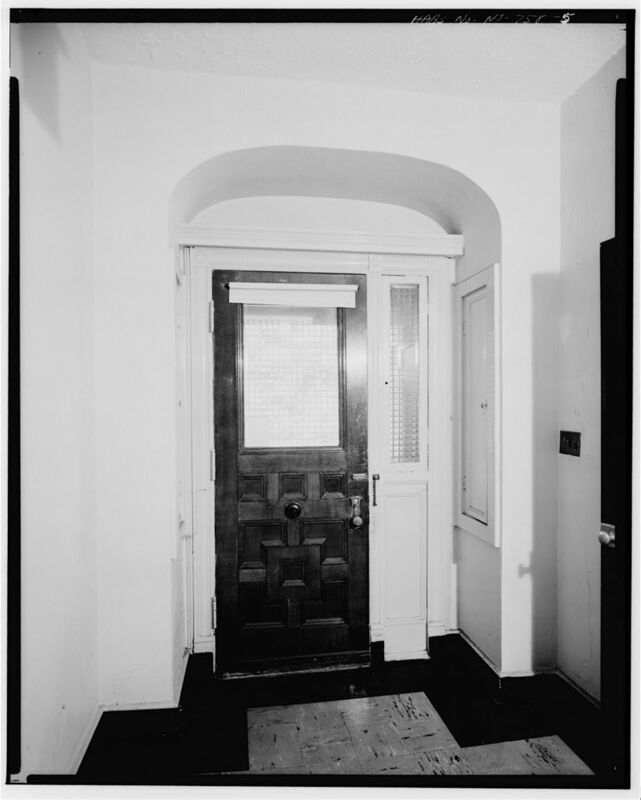 1 The cells were furnished by the Pauli Jail Building Company, as previous. The addition was used for first-time offenders and those awaiting grand jury action. A two-story hospital, with room for 12 beds and an emergency operating room, a doctor’s office, and a dentist’s office, was built in 1909. 1 It was complemented by the construction of a two-story laundry facility and a small maintenance structure. They became the last additions to the Essex County Jail. 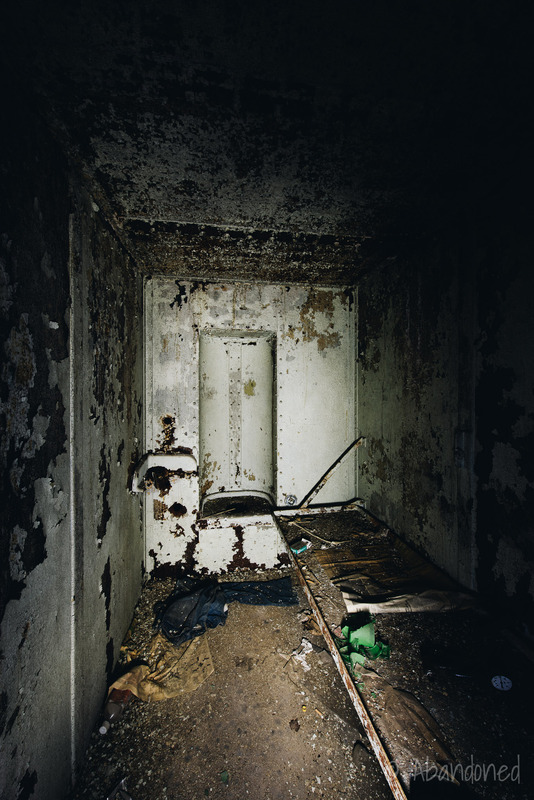 By the 1960’s, the Essex County Jail was in poor physical condition and was vastly overcrowded. A riot on September 30, 1968, involving 180 inmates, went on for nearly two hours and involved broken furniture and fires, but no injuries. 5 About 180 inmates were temporarily transferred to other facilities. Another riot on April 27, 1971, involved 200 inmates. 6 At the time, the jail had 514 inmates or 147 above its stated capacity. The new Essex County Jail was scheduled to open in 1970, 7 but delays in construction forced it to open in August 1971. After the new facility opened, the county Narcotics Bureau moved into the former Warden’s Office at the old jail. 2 A judge ordered the Narcotics Bureau to relocate in 1989 over the deteriorating structural conditions and an inter-agency dispute. During the hasty relocation, hundreds of confidential documents were left behind, including evidence, wiretapping transcripts, and case files. In 2000, 3 the city of Newark acquired the former jail from the county on behalf of the non-profit group, University Heights Science Park, using a $750,000 federal grant. 2 The group proposed to build a 50-acre science and technology park and include one million square feet of laboratories and offices. Most of the jail complex would be demolished, except for the warden’s house and a section of the 12-foot-high brownstone walls, to make room for two new structures. Rutgers Law School applied to de-register the penitentiary from the National Register of Historic Places and the New Jersey Register of Historic Places in July 2017. 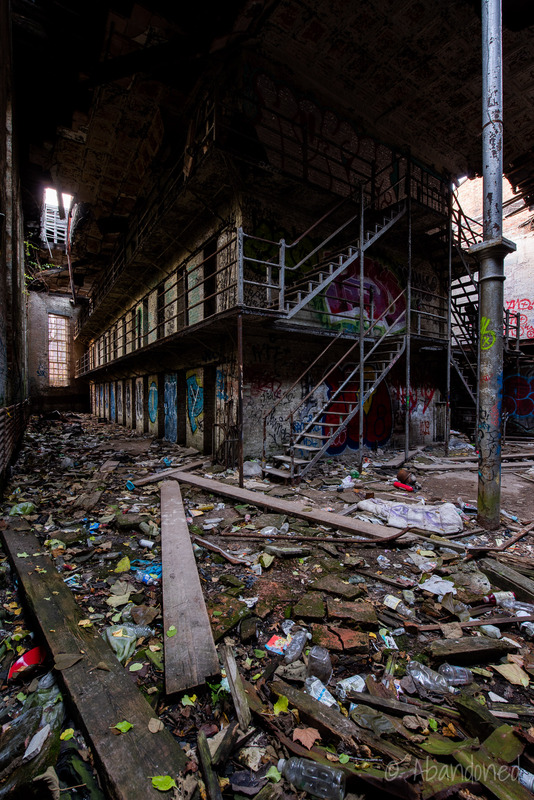 4 De-registering the site would allow for demolition plans on the jail to go forward. PHotographed by George Eisenman, 1967, Historic American Engineering Record, HABS NJ-758. United States, Congress, National Park Service, Ulana D. Zakalak. “Essex County Jail, Newark, Essex County, NJ.” 1990. Article. Read, Philip. “Newark landmarks commission seeks to preserve historic Essex County Jail.” Star-Ledger [Newark], 22 Jul. 2010. 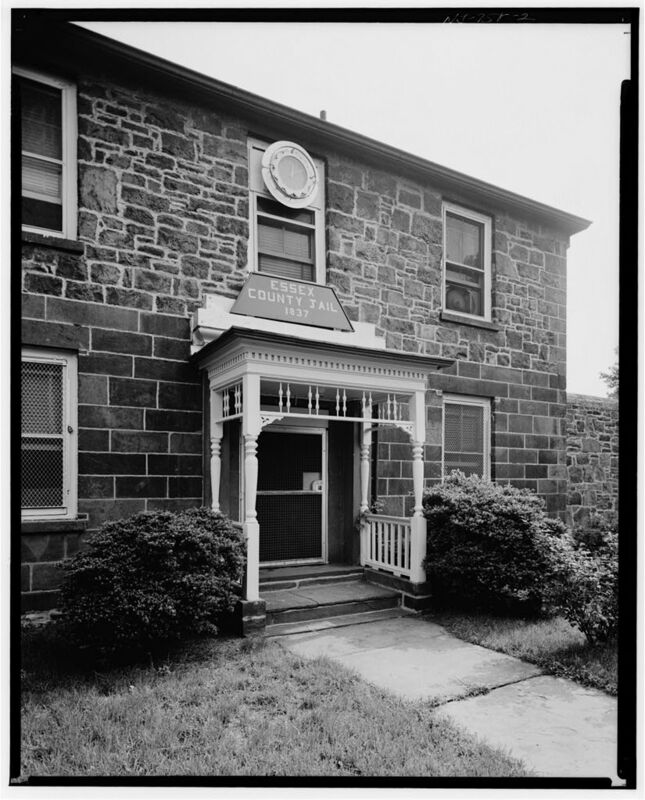 “Essex County Jail.” New Jersey Historic Trust. Article. Kofsky, Jared. 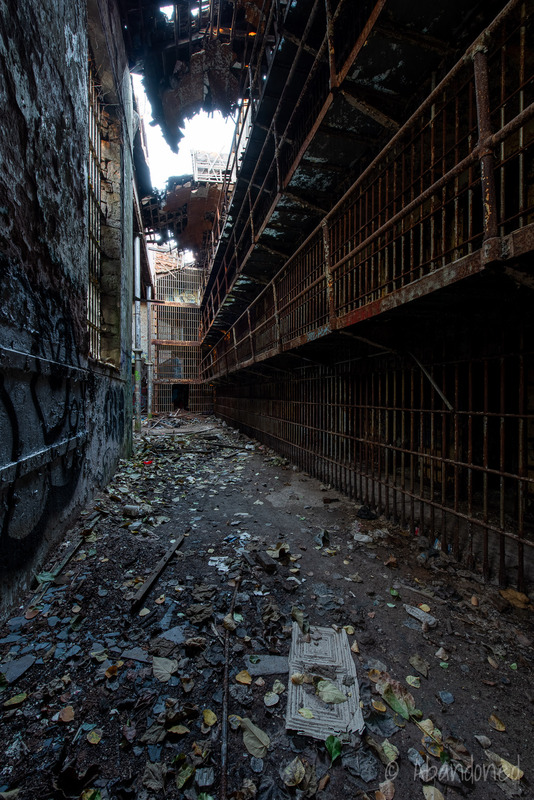 “City Plans to Demolish Newark’s Abandoned Essex County Jail.” Star-Ledger [Newark], 7 Jul. 2017. “Essex Jail is Calm After 2-Hour Riot.” New York Times, 1 Oct. 1968. p. 36. “200 Riot in Newark Jail Over Conditions.” New York Times, 28 Apr. 1971. p. 42. “Reforms Demanded at Essex County Jail.” Courier-Post [Camden], 29 Apr. 1971, p. 8.